← Eggplant, Prosciutto & Cheese "Sandwiches"
Buffalo Chicken Sliders for a Virtual Baby Shower! Happy Monday, everyone! Hope you had a great weekend. I did – a wonderful time with family/friends, along with a lot of exciting sports – with both of my favorite teams winning yesterday, I’m feeling the spirit. So, the timing of this post couldn’t be more perfect! My friend Jessica, from The Jey of Cooking, is expecting her second child one month from today. And it’s a girl! Her adorable little boy is going to be a big brother 🙂 So exciting! Jey is a huge baseball fan, so what theme would be more perfect for her virtual baby shower than ballpark food? 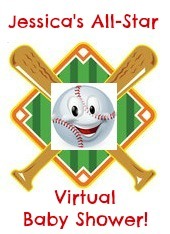 It’s an All-Star event that will have you all yearning for your favorite stadium eats! Many of you know that I pretty much love buffalo ANYTHING. And I think Jey does too. So, I think she’ll appreciate my contribution, which is quick, easy, delicious…perfect to eat while rooting for your home team. I’d normally make this in the crockpot for a large crowd, but since I was only feeding a few, I made a faster version. Jey, congratulations again…I hope we hit this virtual baby shower out of the park for you! Shred cooked chicken and place in a bowl. Add hot sauce and dressing and mix. Taste and adjust ingredients according to your liking. Spoon onto slider rolls and serve. This entry was posted in cheese, chicken, QuickAndEasy, sandwiches. Bookmark the permalink. 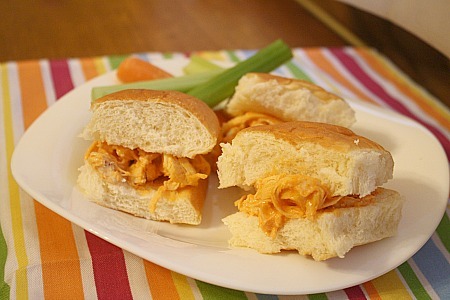 2 Responses to Buffalo Chicken Sliders for a Virtual Baby Shower! I want to snack on these right now! And you’ve inspired me to make some buffalo chicken to keep stocked in my freezer for an easy meal when baby girl arrives.